Welcome to the Walleye Capitol of the World! Parker Here is located in the Western Basin of Lake Erie, just between Cedar Point and Port Clinton, Ohio. I specialize in walleye and yellow perch. 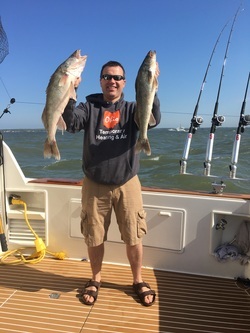 Charter fishing on Lake Erie can be a wonderful experience and can save you from the expense of owning your own boat and equipment. Fishing can be a family affair, so bring your loved ones. I enjoy teaching children and young adults all the tricks of the trade.All bait and tackle are furnished at no extra charge. For added convenience, lodging is available close to our marina, Anchors Away. I appreciate your business and look forward to fishing with you!